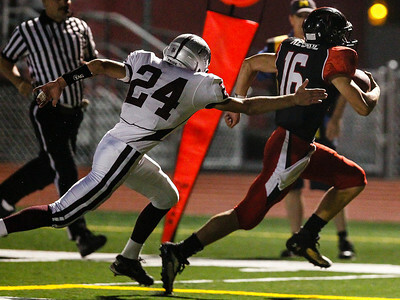 Lathan Goumas - lgoumas@shawmedia.com Huntley's Jake Scalise avoids a tackle by Manny Stier of Prairie Ridge during the first quarter of a game at Huntley High School in Huntley, Ill. on Friday, Oct., 4, 2013. 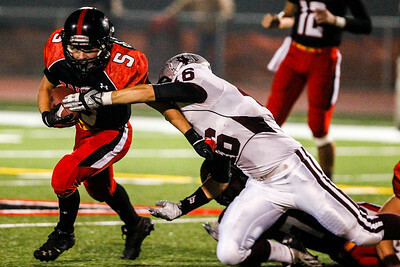 Huntley defeated Prairie Ridge 34-7. Lathan Goumas - lgoumas@shawmedia.com Huntley players Drake Slater, Sam Kunde and Brandon Altergott wait for the start of a game against Prairie Ridge at Huntley High School in Huntley, Ill. on Friday, Oct., 4, 2013. 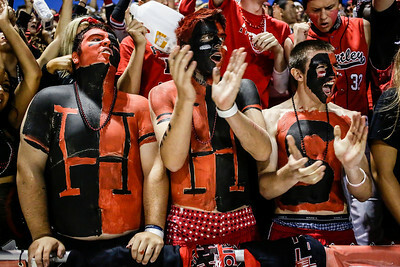 Lathan Goumas - lgoumas@shawmedia.com Michael Lyp(17), Tyler McCallister(15) and Brandon Duvall(16) cheer as the Huntley High School football team takes the field of their homecoming game at Huntley High School in Huntley, Ill. on Friday, Oct., 4, 2013. 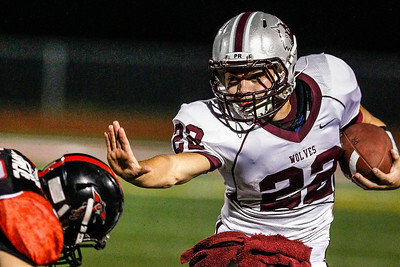 Lathan Goumas - lgoumas@shawmedia.com Brent Anderson of Prairie Ridge runs the ball during the first quarter of a game against Huntley at Huntley High School in Huntley, Ill. on Friday, Oct., 4, 2013. 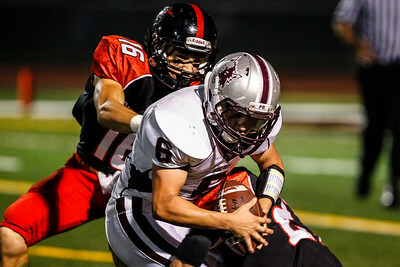 Lathan Goumas - lgoumas@shawmedia.com Prairie Ridge's Colin Rempert is tackled by Huntley's Kyle Kesul(16) and Connor Boos (21) during the first quarter of a game at Huntley High School in Huntley, Ill. on Friday, Oct., 4, 2013. Lathan Goumas - lgoumas@shawmedia.com Kyle Kesul of Huntley scores a touchdown as Jacob Reid of Prairie Ridge tries to defend during the first quarter of a game at Huntley High School in Huntley, Ill. on Friday, Oct., 4, 2013. Lathan Goumas - lgoumas@shawmedia.com Huntley fans cheer during the first quarter of a game at Huntley High School in Huntley, Ill. on Friday, Oct., 4, 2013. Huntley players Drake Slater, Sam Kunde and Brandon Altergott wait for the start of a game against Prairie Ridge at Huntley High School in Huntley, Ill. on Friday, Oct., 4, 2013.